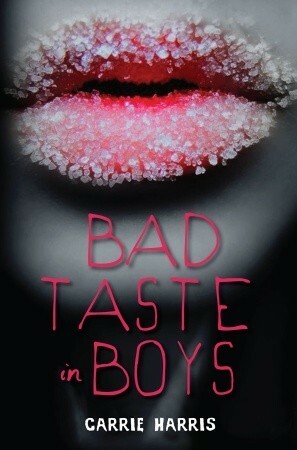 Midnyte Reader: Bad Taste in Boys. 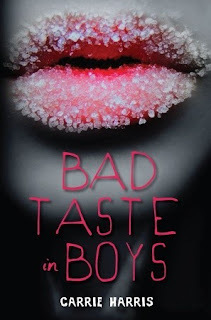 Title/Author: Bad Taste in Boys by Carrie Harris. Publisher: Delacort Press for Young Readers. Favorite character: Kate and Jonas. Synopsis: Someone's been a very bad zombie. Kate Grable is horrified to find out that the football coach has given the team steroids. Worse yet, the steriods are having an unexpected effect, turning hot gridiron hunks into mindless flesh-eating zombies. No one is safe--not her cute crush Aaron, not her dorky brother, Jonah . . . not even Kate! She's got to find an antidote--before her entire high school ends up eating each other. So Kate, her best girlfriend, Rocky, and Aaron stage a frantic battle to save their town . . . and stay hormonally human.~Goodreads. My Thoughts: When I saw this cover before it came out and found out what it was about I wanted to read it. It was lieing around my guest room (where my books live) for a long time and I kept passing it over. But I needed something light and easy to read, plus it's not a tome (only 201 pages). I am happy to say this book surpassed my expectations. I was caught up in the story right away and in Kate's awkward, self proclaimed dorky voice. She is funny and self depracating, but does not come off as whiny or a constant "poor me" type. In fact, she is anything but a victim as she navigates the mystery of the zombie outbreak and what's more proving it so the powers that be believe her. All the while she is also dealing with High School and her crush on one of the Football players, Aaron. I also liked that some of the more popular kids were also her friends. Kiki is a cheerleader and gorgeous, but also nice and befriended Kate without any agenda. I thought this was refreshing and original. She does have some trouble at school and with certain people, but does not lament or dwell too much on it, but uses humor and practicality and seems to accept and at times thrive in her place as a geek. Although her mom is overseas teaching and her dad is a bit preoccupied, I still like the fact that she seems close to them. And, I love the relationship between her and her younger brother Jonas. They are so cute and very enjoyable to read about. Jonas is hysterical and heroic and everyone should have a brother like him. The romance is present, but not the main concern. Aason is on her mind, at some times more heavily than on others, but Kate's main concern is the "zombie virus" and what or who is behind it. She's got her priorities straight. Although Kate's humor made the scary parts a little less so, I still thought they had some real "bite" to them. (Sorry.) There was gore and zombie run-ins and close calls. The story and plot move and make this a fast, fun, thrilling read. I absolutely LOVE this cover and I was really disappointed to see that it has zombies in it because I do not like zombies (they creep me out something fierce). :( But I'm really glad you liked it! Kate was definitely the best part of this book. She is a great character! @Kim-I think you should try this one anyway. The zombies were important but it was more about Kate. I love that cover!! Glad to hear the story lives up to it. I just saw that there will be a sequel - Bad Hair Day I think it's called. Awesome review! I have been wanting to read this book. I love the cover!! You know, with so many stories about stereotypical characters, it is nice to see a popular person befriend someone for no other agenda. Like you said, it's refreshing. @Karen-Yes, the cover is brilliant! It was a cute book. Just right for what I was looking for. @Savvy-Thanks! I'd love to know what you think about it. @Missie-It really was a nice difference from a lot of other books out there. And yes, you can move into my spare bedroom. @Steph-Oh yes, you should definitely read it. The scary parts as well as the funny parts were well done. Yes, I want to read this book! I have to be honest, when I first saw the cover I just assumed the book was about fairies or vampires. Zombies are so much cooler, and this definitely sounds like my kind of book! @Kate-I think you'd like this one. 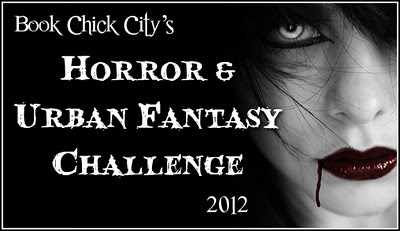 I can see why you'd think it was vampires, but I never thought of fairies...but I can see it now that you've said it.